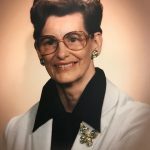 Helen Ruth Neely Burkhalter Fuller passed away August 11, 2018. Graveside: 10 a.m. Tuesday in Springtown Cemetery. Visitation: 6 to 8 p.m. Monday at Biggers Funeral Home. Helen was born February 2, 1922 in Reed, Okla. to the late Bennett and Della Neely. She worked at Monings Department Store in downtown Fort Worth before becoming a full time homemaker. Helen married J.D. Burkhalter in June of 1938 until his death in 1987 and then married Olin Fuller in October of 1991 until his death in 1992. She was preceded in death by her parents; two husbands; daughter, Vondell Wallace, grandson, Ricky Wallace; six brothers, Elvie, Arzie, Clyde, Earl, Newton, and Herman Neely; four sisters, Belva Snow, Lois Stroud, Mary Woolsey, and Esther Westbrook. Granddaughter, Debbie Sanders and husband, Tony; grandson, Jerry Wallace and wife, Edie; son-in-law, Virgil Wallace; sister, Mildred Barker, and numerous nieces and nephews.